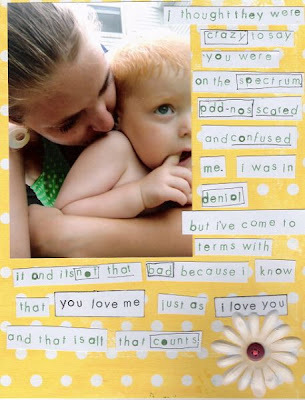 I made this scrapb ook page about a month or two after Brian’s initial diagnosis- at the time it was PDD-NOS, I think our first evaluator just wanted to ease us into the world- as later on we realized he was definitely “full-blown” autistic- as the next two evaluations confirmed. I love this layout though- and sometimes when I am just feeling too stressed with issues surrounding us I like to read this. And remember that he does love me even if he can’t always show it. I love him so much- and always will, no matter how little or how much he progresses. That is all that matters.